A map of the Pilbara region of Western Australia showing the pastoral lease boundaries and names and their tenure. Includes an index of pastoral leases. Department of Agriculture and Food, WA. 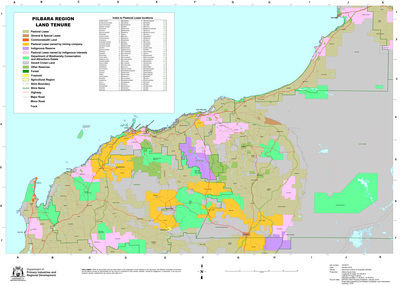 (2019), Western Australia Pastoral Land Tenure - Pilbara Region. Department of Agriculture and Food, Western Australia, Perth. Map.